David Powers King: Post: 2013 Blog Schedule, Cover Reveal, and Updates! Post: 2013 Blog Schedule, Cover Reveal, and Updates! As promised, I has a plan now. Want to know what it is? Cool! Just follow me and watch your step - still cleaning the scraps. Mondays: Post - This is my opportunity to share whatever amazing news I can find around the Blogosphere. It could be Book Launches, Agent/Deal Announcements, Cover Reveals, and the like. I may not always spot everything, so if you want me to shamelessly plug your stuff, I have zero-shame. I'll spread the awesomeness if you drop me a line. 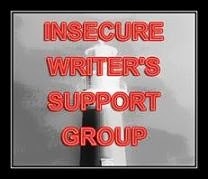 I will continue to announce latest members and give weekly updates on where I'm at in my writing journey. Sound good? Cool. Tuesday Tropes - This series is too much fun - it's staying! Wednesdays: I Read/Watched/Saw This - On Wednesdays, I will review something, be it a book, movie, game, TV series, and the like, and I intend to read at least one book a month. That's not nearly as cool as three books a week, but a cosmic knight's gotta do what a cosmic knight's gotta do - they'll be mostly sci fi and fantasy entries. Ah! But I will reserve the first Wednesday for IWSG, of course. Thursday Scores - I just started this series and it's quickly growing on me. I listen to all kinds of scores, so this is another way to share something I love with all of you - and I'm going to take it one step further by tagging someone I know in the Blogosphere that the score reminds me of. Get ready to have your own theme music, peeps! 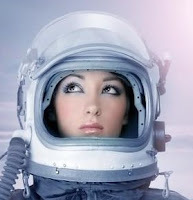 Fridays: Aspiring Advice - This is the series that got the asteroid rolling for this blog two years ago. I'm not about to quit. However, I've played it safe, and I think it's time for some opinion to go with these columns. You may not agree with my advice, but I'm running on what I've experienced and researched, so I'm open to learning. In short, my goal is to help others think or see an aspect of writing in a different way that may not be conventional, as I don't believe there is one right way to write, just what works. Discussion will be welcomed. If there's a Blogfest, Hop, Giveaway or Announcement (I hope) that I'm interesting in joining/hosting that may conflict with any of these days, I'll take a break from the program and do that. Now, for the biggest change of all. To help me actually get some writing done and recharge my idea centers, I will take the last full week of every month off, unless there's more than three days transition into next month (as not to conflict with the first Wednesday of every month). This ship is filled to the brim. I need loyal members to help me helm the bridge, so I will invite someone in the Blogosphere to be a guest and provide a post, an interview, or use my space for whatever, and share it here on the last Wednesday of every month. Those selected who accept this quest shall be dubbed: Knight of The Cosmic Table (space-time can take any shape, so it will accommodate many), and they will also receive an official badge to prove their stellar valor! You can see my updated schedule for the year here. Sound like a plan? I'm excited to get this going. Now you know what I'm up to. You are welcome to visit on whichever days you like, and I will commit to reciprocating every comment. I'll do more than that when time permits. Now, you might be thinking, when are you going to have the time to do all that, Dave? Well, let's just say ... my Saturday mornings will never be the same. Ready? Steady? Go! 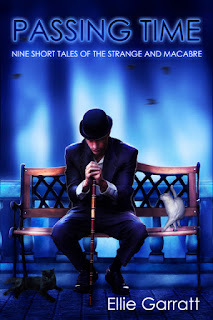 I'm pleased to announced my good friend (and no stranger to this blog) Ellie Garratt's stunning cover release for Passing Time, a collection of Nine Short Tales of the Strange and Macabre! In Dining in Hell, the Death Valley Diner becomes the wrong place to stop. A serial killer wants to add another file to his collection in The Vegas Screamer. In Eating Mr. Bone, an undertaker could meet an unfortunate end. A con man meets his first ghost in Land of the Free. And will truth finally be set free in The Letter? Mark the release date: 11th February 2013! Please visit Ellie’s blog on Friday 11th January, when she will be interviewing Passing Time’s cover designer, Ida Jansson! Please welcome our latest members of The Cosmic Laire - there's nothing like a new member Shout-Out to start off the new year! 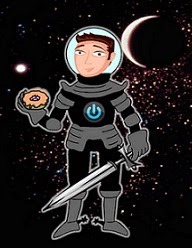 You'll find your virtual cruller is your quarters - welcome aboard! 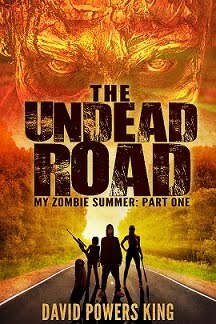 Update: Having reached the midpoint of UNDEAD, I went back and applied all feedback/critiques and edited through it all - and boy, it's looking great, and much funnier than it is scary ... it's Upper MG, after all. 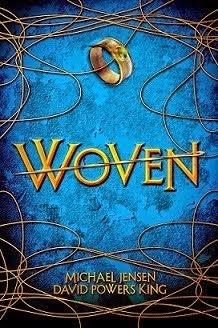 Also, Michael and I went back through our first chapters of WOVEN, after some amazing feedback, and applied small changes. Hopefully that will make all the difference - we haven't given up on it yet, but we have decided that this story needs to get out, one way or another. If we can't land a deal or contract by June, Self-Publishing, here we come! That's the pending plan, so now's the time to hop on board, Powers That Be. We're game if you want in on this action. Whew! That was a long-winded post, yeah? Time to wrap this up and let you go. This is going to be a powerhouse year with more releases and deals than I can count, a couple new manuscripts from me as well, and I look forward to see every one of you succeed. Write on. You are, after all, the conduit for a story that is yet to be told. What's your plan for 2013? Making any changes to your blogging? Planning any conferences this year? Who wants bacon? I'm David, and I'm still going to end posts this way! Sounds like a plan! You're more organized that I am - other than my three days a week (and the standard Ninja News) I never know what I will post about until the day before it happens. And good news on your manuscripts. Just gearing up for the A to Z Challenge and then the launch of my third and possibly final book. That's a good schedule. I write most of my entries far enough in advance that I don't worry about needing to recharge batteries. You are amazingly organized and focus. I love Ellie's cover-- very cool. And finally, good for you for making health a priority; we should all be so motivated and inspired. All the best to you, David. I just posted Ellie's cover to my site, and I love it. It's great to be able to help a fellow author out. That's ambitious. I blogged daily for years but just can't maintain that pace anymore. I don't have enough time every day to visit other blogs. Me! Me! I want to be a Knight of The Cosmic Table! Thank you for taking part in my cover reveal, David. I am feel honoured to be passing time on your blog today. Your new blog schedule looks great. I especially like that you are taking one week in four to concentrate on your writing. Writing should always be your priority. Good luck with your manuscripts! Your schedule sounds wonderful, especially the part about taking a week off. As soon as I get my ms back from my critique partners, I'll be in the revision process too. I just ate bacon! I have it like... most mornings :) haha. Sounds like a great plan to me. Hopefully I'll have some good news this year for you to shamelessly plug on a Monday. :) I plan on tuning in every day. And get some sleep! Love your plan for the new year!!! I'm totally going to try out Ellie's book. Sounds great! This year, I'm going to finish querying, finish a book, and get organized. Whoop! And yes, I'll be at LTUE. Love that conference. ;) Happy 2013 David! I like your schedule, just make sure you'll get the rest you need. Yeah for Ellie! Her book cover is fantastic. (: All the best for 2013!! Sounds like you've got a plan that's going to work for you. I hope you have a speedy recovery! And I hope your new schedule helps you. That cover is FANTASTIC! I'm totally impressed with your plan! Looking forward to more awesome posts this year! I hope you never stop ending posts that way. Hope you find some time to relax outside of that one week a month, too. ;) Glad to hear your classic sign-offs will stay. sounds like a good schedule and I enjoyed the sign off! Aw, thanks for the shout-out!! And thanks for reminding me about Ellie's cover release! it's fantastic!! The schedule looks great! I'm so glad Tuesday Tropes and Thursday Scores are staying for good! Good luck with your schedule. And I love this cover. Congrats to Ellie! I don't actually like bacon (un American, I know) so you can have mine! Your schedule looks wonderful. I wish I were that organized in my every day life! Great schedule! I've been thinking of changing things up a bit on my site as well since I've been getting overwhelmed with projects lately. We'll see what I come up with. I don't think you would be David if you didn't end posts that way. That's when we'd have to mobilize to destroy your automaton copy. I only ever managed to post 3x per week at my best, and last fall I knocked it back to 2x per week, except for special events. But then I joined Project Middle Grade Mayhem, so that's another post a month, and I expect I'll be doing guest posts for the launch of The Caged Graves in May. I'm in awe of your schedule! Good luck with it all. I actually can't imagine doing daily posts - hopefully the week off will be a good chance to recharge. Ellie's book sounds brilliant - I'll look out for it. Those are some snappy tag lines for those stories. Wow! You are way organized. I am only posting on Mondays so as to keep my focus on writing when I get time to sit at my computer. Way to go on your WIP progress. I'm thinking more and more that self-publishing sounds like the way to go, but I'd like to do the traditional route at least once, first. 2013 is about the writing. I had a lot going for 2012 and didn't make as much progress as I'd hoped. I got a little tired reading your schedule let alone trying to follow it. Hope it works for you. I want bacon :D I love bacon! Your new blogging schedule sounds pretty full on, so the best of luck to you and your Saturday mornings, which is where I'm assuming you're going to formulate every single blogpost for the week. Keep well and blog on! Dude, you have 2013 mapped out! That's great. Looking forward to Wednesdays!! You're amazing, David! I'm with Dianne on the "that's cutting back?!!!" But I'm glad you're taking a recoup week at the end of each month to get some R&R and writing time. Thanks for keeping up such a fantastic blog! Wow, you really thought this out. Good luck with everything. I myself don't think I can pull off daily posts, and it's so impressive what you're doing. Wishing you all the best for a happy and successful 2013! That is a great cover for Passing Time. Thanks for the shout out David :)! Great blog - I'm looking forward to reading it :)!